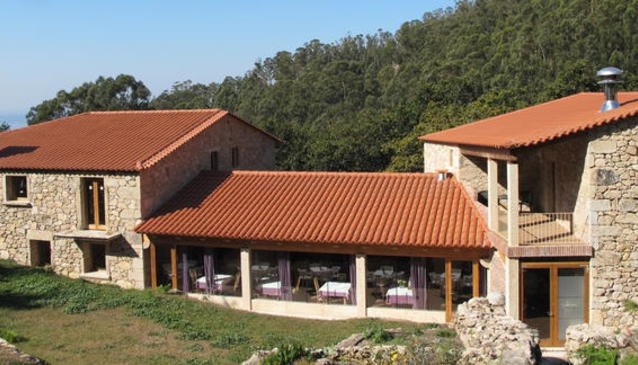 Situated by the river Pineiro as it runs to the sea, in its steep sided valley is the 'Casas do Sobral' a family run hotel and restaurant with a traditional warm Galician welcome.Restored using natural materials and traditional building techniques, it embraces the future with its eco friendly use of sustainable fuels. Here is the perfect escape from the pressures and stresses of modern life. A place where eagles soar, butterflies dance, stars shine and the sound of the sea lulls you to sleep at night. A natural paradise, where for a while you can discover a life you may have thought was passing into extinction. In this beautiful and tranquil location you will have the time to relax, reflect or just enjoy the amazing bio-diversity that surrounds you. However, for those of you who require more activity, close by are walks to natural parks and historical sites and all manner of sporting activities, sea, land and air and 20 minutes away are the bright lights and thriving night life of the city of Vigo. The natural park : Sobreiras do Faro is close to the hotel which is on a walking route. The restaurant serves a range of local food and wines which the chef makes uniquely his by adding a dash of Jamie Oliver to it, with a generous pinch of herbs, an experience not to be missed. Mark Johnson said after a celebratory meal there 'This is one of the best meals I've had in Galicia, indeed in all of Spain and I have visited a number of Paradores'. Special dietary needs can be accommodated if booked in advance and all types of function can be catered for. Enjoying views to the Atlantic Ocean all rooms are en -suite with traditional surroundings and modern facilities. Facilities for the disabled are available. Tel 651 907 477/986 361 568.